Even with the most diligent of efforts to maintain your child’s oral health he is likely at some point to get a cavity. Don’t blame yourself, it happens. 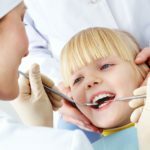 The good news is that since he has been seeing a pediatric dentist on a regular basis your child’s first cavity will most likely be a small one that can easily be treated. As simple as the procedure may be it’s still a first time experience for your child. There are steps that you can take as a parent to make the procedure less stressful for everyone. Dentists recommend that you stick to the basics and skip the details. Though you may have the best of intentions your own feelings of apprehension may show through if you try to over explain things. Keep in mind that a pediatric dental procedure is much different from the adult version. Who should go, mommy or daddy? Calm and cool is the phrase of the day so whoever can bring that air of composure to the appointment is the parent of choice in this particular situation. Children can sense anxiety. One of the most important things to remember is that you have put your child in the capable hands of a pediatric dental professional, one who is trained and experienced in dealing with children’s dental issues. You can trust Dr. Kaelin and the staff of Kaelin Pediatric Dentistry to put the comfort of your child first and foremost. Call today @ 303-835-9330.